. . . salt is necessary for life itself; living bodies eliminate it, and without replenishment by ingestion, humans and other animals soon die, which is why animal trails lead to salt licks, and the first human paths did, too. Moreover, salt is a dandy preservative of meat, vegetables, and, as the ancient Egyptians knew, corpses. 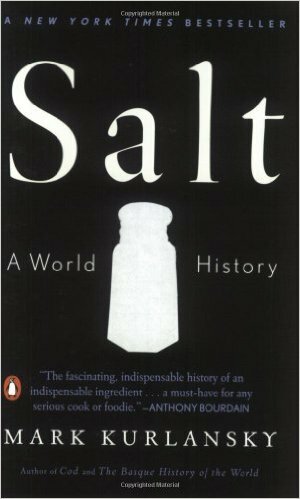 Homo faber figured out how to get salt out of brine, a discovery that increased the number of places people could prosper. Still, though salt is a very common substance, it is not always easily accessible, and weather and climate can make extraction from brine impractical. Hence, salt became the basis of wealth for communities, principalities, and empires, even after the invention of refrigeration and the diagnosis of hypertension. This is the big story Kurlansky unfolds in chapters that proceed from time immemorial to the present and cover such specific topics as “Salt’s Salad Days” in ancient Rome; the “Nordic Dream” of enough salt for all Scandinavia’s herring, not to mention lakrits (salted licorice); how, just as oil won the Big One, salt largely won the War between the States; and why, when Gandhi really got down to persuading the British out of India, he started with a “salt march.” Tasty, very tasty! –Ray Olson in Booklist Review.